1. The quickest way to make me gag is to prepare any egg dish where the white is clearly visible. The only way I can tolerate egg white is hardboiled or as a meringue. I consider any other method vile and unpalatable. When making omelettes I beat and beat and beat to destroy all those yucky streaks. If i discern them in the final product I will not eat it. 2. As a child I could not stand any semblance of meat fat, skin, cartilage, or gristle. They made me retch and I called them ‘googoo’. I am now 30 and I still think of them as ‘googoo’ and am not a huge meat eater as a result unless it is filleted, minced, or boneless. 3. Tabasco sauce is the Koolaid of pepper sauces. I could drink it straight from the bottle and sometimes did in college. (They used to put these mini bottles of it on the tables sometimes). 4. Cheese and sweet pickle sandwiches were the best school lunches my mom would pack for me. Love is a cheese and sweet pickle sandwich. 5. The sweet pickles seem to have vanished from the supermarket shelves so we have transferred our love of the green and yellow (subliminal Jamaican propaganda? :P) to cheese and bhagi sandwiches. Love is a Cheese and Bhagi sandwich. 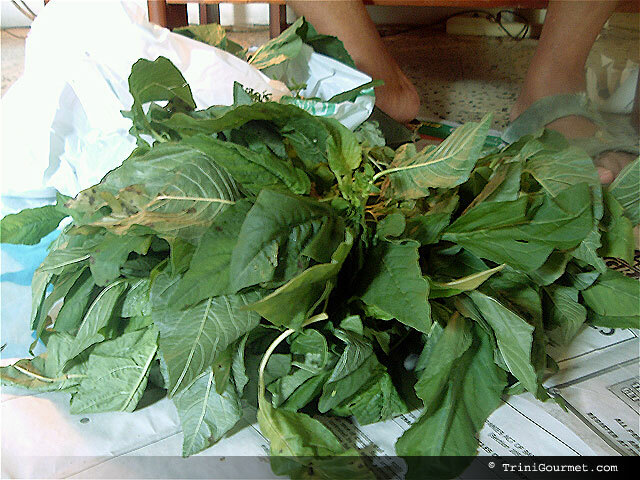 Bhagi (also spelled bhaji) for those not in the know is what we in Trinidad call the amaranth plant. It is used extensively in cooking here, usually as an accompaniment to curried dishes or in callaloo. Amaranth greens, also called Chinese spinach, hinn choy or yin tsoi (Simplified Chinese: ?????????????? ; pinyin: xi???nc?? ?i), callaloo, tampala, or quelite, are a common leaf vegetable throughout the tropics and in many warm temperate regions. They are a very good source of vitamins including vitamin A, vitamin B6, vitamin C, riboflavin, and folate, and dietary minerals including calcium, iron, magnesium, phosphorus, potassium, zinc, copper, and manganese. Because of its valuable nutrition, some farmers grow amaranth today. However their moderately high content of oxalic acid inhibits the absorption of calcium, and also means that they should be avoided or eaten in moderation by people with kidney disorders, gout, or rheumatoid arthritis. Reheating cooked amaranth greens is often discouraged, particularly for consumption by small children, as the nitrates in the leaves can be converted to nitrites, similarly to spinach. 6. I am scared of compote. I think it is th3 evil. My best friend Lynn of RedSheepCrafts.com believes that she convince me otherwise, I shall wait and see. 4. Burekaboy of Is that my Bur?? ?ka?